Some places are meant to burn; in fact, they are healthier for it. A forest or barren of Jack Pines in Michigan requires heat to open the pine cones so they can release the seeds. Fire also prepares the ground for germination of Jack Pine seeds. 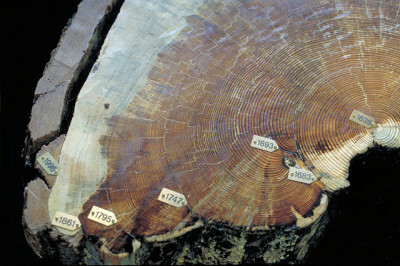 Without periodic fires, Jack Pine stands age and die off. 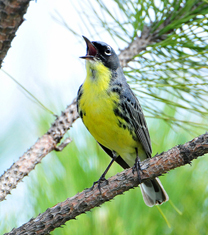 The endangered Kirtland’s Warbler nests below young Jack Pines between 5 – 20 years of age growing in sandy soil. With the advent of modern fire suppression, the number of young Jack Pines continues to diminish and, with it, the Kirtland’s Warbler habitat. Ponderosa Pines tower above us in the mountains around Santa Fe. Ponderosas also rely on fire to maintain a healthy habitat in which to thrive. Low-intensity fires clear seedlings and young trees creating open spaces between the survivors. Ponderosas are uniquely adapted to drought and naturally-occurring forest fires of the Southwest. They have long taproots that give them access to moisture during drought and are less likely to be damaged by heat from surface or brush fires. They have fire-retardant bark as thick as 3″ that sheds in scales around the base of the tree and smolders slowly when burned, and self-pruning lower branches that drop as the tree grows. The crown of Ponderosas is open, letting heat from fires escape. They are more likely than other conifers in our area to withstand low-intensity fires moving across the ground. Santa Fe’s historical record contains stories of smoky skies in summer from naturally occurring fires caused by lightning in the Ponderosa forests. As development patterns changed, these forests were used not only for gathering firewood, grazing, hunting and recreation, but for developments and homes. Fire suppression trends to protect human life and property have had the effect of increasing the fuel load in forests nationwide, allowing fire-cleared swathes that served as firebreaks to fill in. We now live in a different landscape with higher likelihood of catastrophic fires such as the Cerro Grande Fire in 2000 that consumed over 48,000 acres, engulfed part of the town of Los Alamos, and created a plume of smoke that reached Oklahoma. 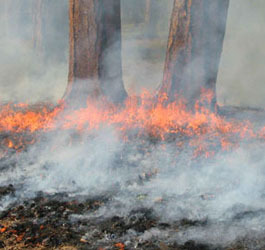 Locals are used to occasional fires during summer season before the monsoons. Drought increases the frequency and intensity of fires, so we’ve seen more frightening fires closer to Santa Fe in recent years. But despite the possibility of fire, the forests are still glorious. There’s nothing like heading up into the mountains for a hike among Ponderosas. If you go on a warm, summer day and press your nose into the bark of a Ponderosa, you’ll get a delicious hit of vanilla from the terpenes, or aromatic volatile oils in the pitch. It’s one of the pleasures of the forest. If you live in or near Ponderosa forests, it’s smart to learn about fire and take action to safeguard your family and property. Although you can’t “fireproof” your property, you can do things to lessen the likelihood of damage or danger from fire. Contact us for more information on designing and planning for fire, and visit the The National Fire Protection Association’s Firewise website for tips on preparedness.